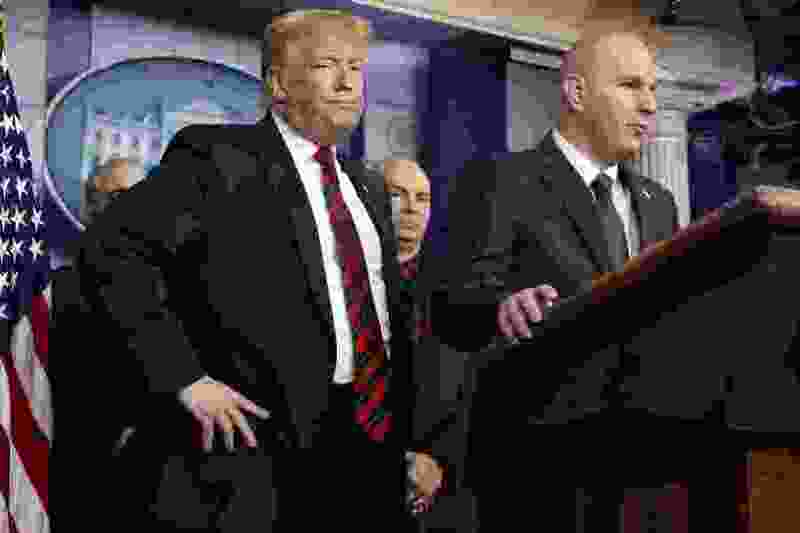 (Jacquelyn Martin | Associated Press file photo) Brandon Judd, right, president of the National Border Patrol Council, talks about border security after making a surprise visit to the press briefing room of the White House in Washington on Jan. 3, 2019. Judd and President Donald Trump share an ominous view of the southern border and a certainty that a wall along the boundary is urgently needed to stop what they’ve described as a humanitarian crisis. Judd, a 21-year veteran of the U.S. Border Patrol, has helped to validate Trump’s fiery immigration rhetoric and affirm the president’s conviction the border with Mexico is a frequently lawless place. Washington • Brandon Judd, president of the union that represents thousands of border patrol agents, has flipped the axiom that there are no winners in a government shutdown. A 21-year Border Patrol veteran, Judd has been a staunch ally since the Border Patrol Council endorsed Trump for president in late March 2016 — its first endorsement of a White House candidate. He appeared at Trump’s side earlier this month in the White House briefing room and joined the president during his visit last week to McAllen, Texas, a city in the Rio Grande Valley where illegal border crossings have surged. But while Judd was in McAllen, hundreds of furloughed federal workers gathered in front of the White House to call for an immediate end to the shutdown. And the American Federation of Government Employees, the federal workers union the Border Patrol Council is affiliated with, is suing the government, alleging it is unlawful to force federal employees to work without pay. According to Judd, the Border Patrol Council conducted a voluntary survey last year of agents in Tucson, Ariz., and Laredo, Texas, and found that nearly 90 percent of them agreed that a “wall system in strategic locations is necessary to securing the border.” Nearly 700 agents responded to the survey. Customs and Border Protection figures for 2017, the latest available, show there were more than 5,350 border patrol agents in Tucson and Laredo. Judd began his career as a field agent in 1997 and five years later was assigned as a special operation mountain team leader in Naco, Ariz., a border crossing directly opposite a Mexican town of the same name. He was later stationed as an agent on the northern border, in Van Buren, Maine, and is currently posted in Montana. Judd attributed the fewer number of members to normal attrition, such as resignations and retirements, and bureaucratic changes that exclude certain positions from being eligible to join the union. Agents who are managers can’t be union members, either. “I don’t know anybody who supports not getting paid for their work,” said Childress, who spent nearly seven years at the border crossing in Yuma, Ariz., and quit after deciding he could no longer justify arresting people for the nonviolent offense of crossing the border.